Sparks and Remarks: To Blog or Not to Blog. . .
“To blog or not to blog?” - I guess that really isn’t the question anymore! But what is the question??? I have been a skeptic, a stick in the mud, a curmudgeon. My company, Ignite, just recently went to an online newsletter from sending out a paper version, for god’s sake. Now I understand that we have to get rid of that and “blog” it. It is not that I am against progress, speed, ingenuity, free speech or opinions; in fact, those who know me well, think I have more opinions than Rush Limbaugh (as if that’s possible). What I am wondering is - what does the blog actually do - what does it actually mean? So I did some research. Here is what I learned: Blogs can set you apart as an expert in your field. 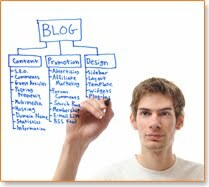 Blogs increase your exposure as a person and a professional. Blogs can enhance your webpage. Good blogs are done by people who are deep, creative thinkers. They have passion and interests and take time to express those interests in a unique way that makes people want to be part of the conversation. I learned that everyone should blog, but not all blogs are good. Some think blogs take too much time, without much return. Some say you need to blog a minimum of a year, before you can even tell if a return is possible. We, at Ignite, are just about to start to blog, and I realized from my research, that we are way behind. What is new to me is old to many. So, it sounds like the upside outweighs the down, so clearly we should be blogging. So what is really bothering me? I guess it is the anonymity of it. Ignite is a training and development firm and we believe that face to face, interactive development creates positive change for individuals and companies. We do not think you get the same results from online training or virtual development. It feels like blogging is a bit that way. There is no true back and forth, where you can hear people’s voices or their tone, or see the energy in their body; asking questions in real time with dialogue feels different from typing. It feels like it is missing something. There is another reason for my discomfort. I miss paper and pen. My mother is ill; she has end stage Alzheimer’s. Recently, we have been going through her “stuff”. There was lots of junk, but then we found a treasure trove of letters - letters back and forth between her and my father, letters between her and my grandparents, and letters from camp from my sisters and me to my parents - a wonderful, fabulous, rich, written history. I realize that my son will not have this experience, because for more than 15 years, the majority of my correspondence has all been via e-mail and online communication. My son and his friends hardly talk, much less write - they all text. It seems very sad to me. I know this is the way of the future, or the way of the now, I guess I should say. So the question is answered! It is definitely not: “to blog or not to blog?” anymore; the question today is: “how can I create great content for my blog?” So we will blog and text and twitter, and I will do it happily, because I want to be the smart, creative blogger that engages people to be part of the conversation. It is my hope that through blogging we will not lose the personal connection, but increase it. You will get to know us and our service offerings better; the relative anonymity of our previously-static website will be enhanced and personalized by our blogging efforts; and ultimately, our blogs will help you make the decision to call us and make that connection. What have your blogging experiences been like? Have they gained connections for you? We encourage your thoughts and feedback. To learn more about us go to: www.weigniteit.com and become the spark in your organization.